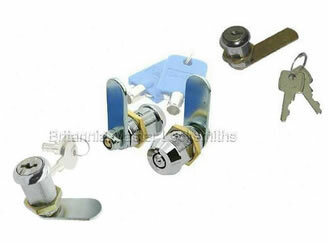 This type of lock comes in 3 main types standard profile, single or double sided key or tubular keys. They are used on types of doors from mail boxes, gym lockers, school lockers, filing cabinets, game machines, vending machines, metal/wood cabinets & many more… The list really does go on and on. The security level of this type of lock is very low and therefore they are generally used on low security containers. Needless to say we can repair it, replace it or upgrade it. See example of cam locks below.